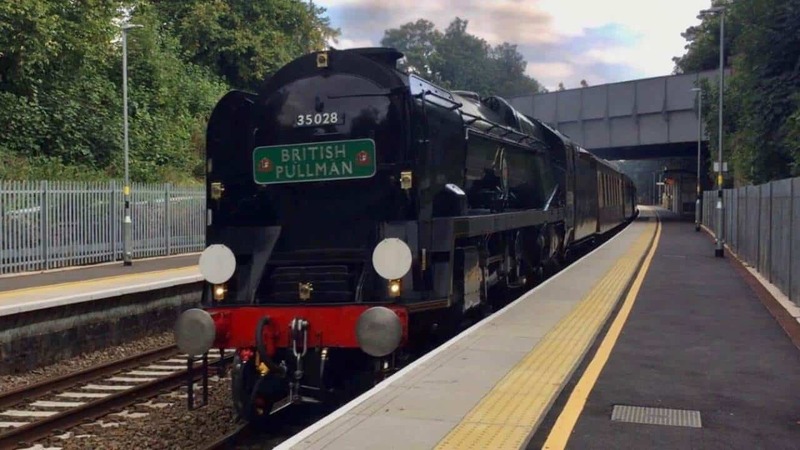 Steam locomotive 35028 Clan Line will be back in steam on the mainline and will be in London and Shalford on Thursday 18th April 2019. The Merchant Navy locomotive is on a special railtour tomorrow. 35028 is hauling ‘The Belmond British Pullman’ railtour on Friday. The steam locomotive will depart London Victoria at approximately 12:28 pm. The railtour will then leave London Victoria, bound for Shalford, where it will steam through Clapham Junction (12:44), Richmond (12:53), Twickenham (12:56), Staines (13:10), Woking (14:04) and Guildford (14:13) before arriving into Shalford at 14:18. After a 20 minute break in Shalford, 35028 Clan Line will depart at 14:38, it will then steam through Gomshall (14:47) before passing through Redhill (15:08). After Redhill, the locomotive will steam back to London Victoria non-stop, steaming through South Croydon (15:25), Selhurst (15:28) and Clapham Junction (15:37). 35028 Clan Line will make its final destination of London Victoria at 15:57. If you do go out and see Clan Line, why not sign up to LocoStop, our brand new railway community, and share your photos from your adventures! Click here to sign up.